James Atkinson (1780-1852) was one of the first Europeans to explore Afghanistan, and served as an infantry surgeon there. The Belgian lithographers Louis and Charles Haghe reproduced his original watercolor drawings as twenty-six individual plates in this oversize portfolio (18 inches x 22 inches). The lithographs were double-tinted (beige and blue, using two different litho-stones) and the brighter details were hand-colored. 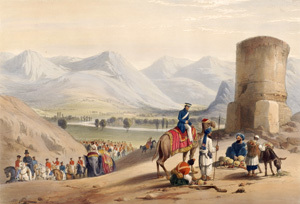 Some of the illustrations depict skirmishes as British troops move through towering mountain passes; but others show local people in tranquil landscapes or village scenes, engaged in activities such as trading. A few scenes include women who are concealed in long white “boorkas” (that head-to-toe cloak is now more commonly spelled burqa, burka, or burkha). 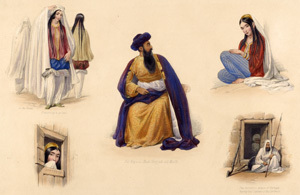 The final plate illustrates how the young women looked at home in Caubel [Kabul] compared to how they dressed for going out in public. Because of the exquisite quality of the illustrations, we bring this portfolio out regularly for art students in Professor Mark Ritchie’s “Printmaking” classes. The cultural aspects are more the consideration for Professor Seth Ward’s “Islamic Studies” classes. Anne Marie also uses it in book history presentations in the library: for example, in the “Book History: Special Topics (19th century)” class. 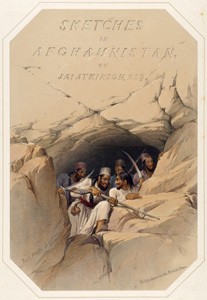 Although the Toppan Library portfolio documents events over 150 years ago, it remains of great interest today because of the continuing fighting, and American involvement, in Afghanistan. To learn more about the collections and programs of the Toppan Library, click here. This entry was posted in rare books. Bookmark the permalink.